Augusta, GA, facial plastic surgeon Dr. Achih Chen understands that enhancement of certain contours of the face can be aesthetically desirable and even masculinizing. When men come in for facial plastic surgery consultations at his Evans practice, Dr. Chen assesses specific facial features. Prominence or lateral projection of the angle of the jaw is a very masculinizing feature (blue arrow in photo), as can be prominence and projection of the chin. 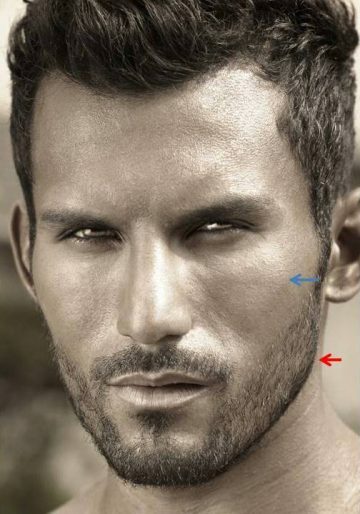 Prominent or high cheekbones can also be aesthetically desirable; however, in men, this feature ideally has less projection than in women (red arrow in photo). In addition, as facial aging occurs, the mid-face undergoes volume loss. Restoring volume loss in men, as in women, is desirable during facial rejuvenation surgery; however, volume restoration must be much more conservative than in women as men often appear most natural without too much fullness in the midface. If you’re considering facial plastic surgery, The Georgia Center in Evans serves patients from Atlanta to Columbia and Charleston, SC. You can request a consultation using the online form to meet with Dr. Chen, or call our office at (706) 210-2625 to schedule an appointment. Angle of the Jaw Implant: As lateral projection and prominence of the angle of the jaw is a masculinizing feature and often aesthetically desirable for men, augmentation to improve prominence of the angle of jaw can be accomplished through angle of the jaw implants. These implants are placed in pairs, one to enhance the projection of each side. They are placed through a small incision near the back of the mouth near the valley between the gum and the inside of the lip or cheek region. Chin Implant: Ideal chin position is determined by positioning the individual’s in Frankfort horizontal where an imaginary line drawn from a point from the bottom of the eye socket to a point at the top of the ear canal is parallel with the floor. In this position (Frankfort horizontal), the chin should project forward to an imaginary line that is drawn from the lower lip downward. 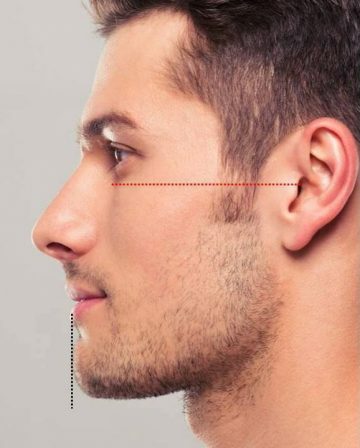 While chin projection to this line is considered ideal, projection of the chin beyond this line is considered masculinizing, while projection behind this line is considered more feminizing. Chin positioning should be assessed prior to facelift or neck lift surgery, as good chin projection will enhance the result. For men, both enhancing the facelift result and creating a more masculinizing appearance can be achieved together. There are many chin implant sizes and shapes available to achieve the desired projection and shape. Men may seek not only increased projection, but increased width of their chin. Dr. Chen, following a discussion of your goals, will help you choose the chin implant to achieve your desired result. The chin implant may be placed through a small incision located on the inside of the mouth or hidden just under the chin. The incision hidden under the chin is most frequently used when chin implants are combined with facelift or neck lift surgery. That’s because it requires an incision under the chin to address excess fat and to tighten muscle bands that may have become lax with age. Cheek and Mid-face Implants: Prominence of the cheekbones is considered an aesthetically desirable feature in both men and women. In men, however, less prominent cheekbones appear more natural. In addition to the cheekbones, there is loss of mid-face volume with aging. The youthful appearing face is fuller than the aging face. Restoring volume of the mid-face restores the youthful fullness. In men, while restoring mid-face volume rejuvenates the appearance of the midface, too much volume can result in a cherub or small child-type of appearance. The key to mid-face rejuvenation that appears natural is conservative volume replacement. Dr. Chen most commonly accomplishes this through mid-face implants. The mid-face implant is different from the cheek implant in that the point of greatest projection is towards the front of the implant while for the cheek implant, the point of greatest projection is further back on the implant. Consequently, each implant achieves different aesthetic results. As a general rule, the mid-face implant is used to restore youthful volume in facial rejuvenation surgery, while the cheek implant is used to create increased cheek bone projection. Both implants are placed through a small incision inside the mouth. During your consultation, Dr. Chen will help you determine the best implant to achieve your desired goals.